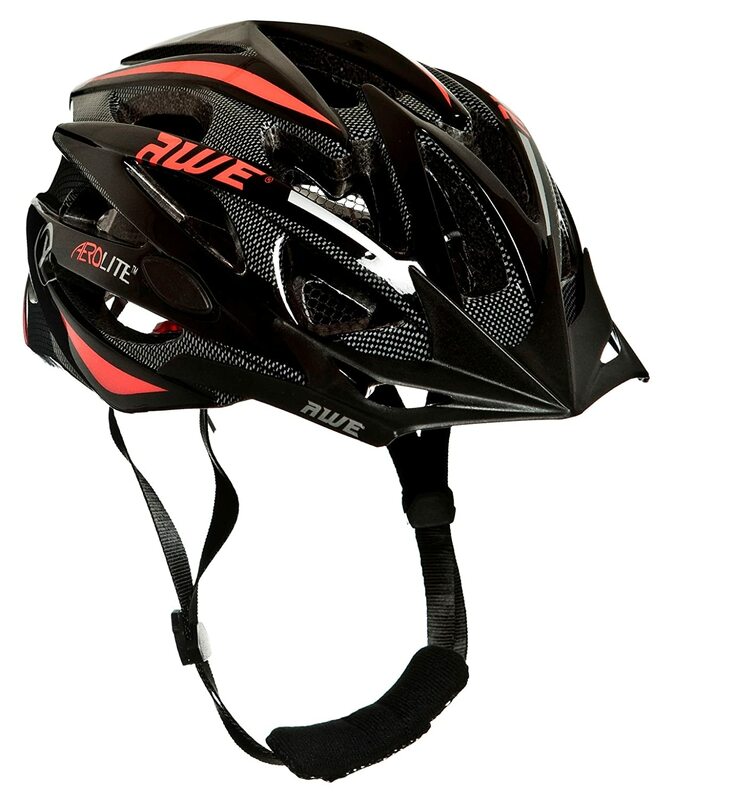 Cycle helmets are essential for safety on the roads, whilst mountain biking, or whilst competing in a bike race. A good cycle helmet provides you with total protection for your skull, without compromising on visibility or weighing you down. There are numerous different bike helmets available on the market. Some of them are super streamlined to enhance your aerodynamics as you race, for instance, whilst others are nice and stylish. You should never cycle without a helmet – and why would you? Modern designs and ventilation systems have made bike helmets both very comfortable and very stylish. Having trouble understanding which bike helmet is the right one for you? No problem, simply use our top 10 list to find the best cycling helmet for your needs. Fit and comfort: do you require a helmet with extra padding inside? In addition, you will want to consider your budget. Can you afford the helmets you are shortlisting? Finally, for many cyclists, style is an important factor. Is it crucial to you that your helmet is just the right colour and that it looks flattering on your head? Our comprehensive list of the 10 best cycling helmets has something for all tastes, needs and budgets. Jump right in and have a great time clicking on the links to explore the helmets reviewed here in more detail. Though it is one of the most expensive items reviewed here (costing around £70), this helmet has features that are worth paying for. Its careful design makes it especially good at shock absorption. It is also designed to withstand multiple impacts rather than just one. The secret to this is its use of dual density materials. A hard outer shell and a softer inner material is used that absorbs shock. It also offers good ventilation throughout the entirety of the body of the helmet. As its name indicates, ventilation is one of the key selling points of this vented helmet. Unlike many comparable helmets, it has ventilation on the rear of the helmet as well as along the sides. This commitment to comfort is also evident in the padded chin strap and the built in sun visor. Price-wise, this is the second cheapest helmet listed here as it can be snapped up for around just £13. This is another dual density helmet by Prowell that looks very cool and professional. It is also equipped with a short visor for additional eye protection. Why choose it over and above the other offering from Prowell on this list? Primarily because of the price. This helmet costs a third of the other Prowell helmet (just £20). Like all helmets from this brand, this product is equipped with a reflective strip for additional night time safety. These colourful helmets cost just under £10, and are very cheap and cheerful. As well as offering no less than 22 air vents for optimum coolness, they are full safety tested and offer several customisable features. The visor is removable, for instance, and the chin strap can be adjusted to suit your needs. This helmet is by far the cheapest option here. If you are on a tight budget but do not want to have to compromise on your safety, this item is the obvious choice. Ideal for summer cycling trips. 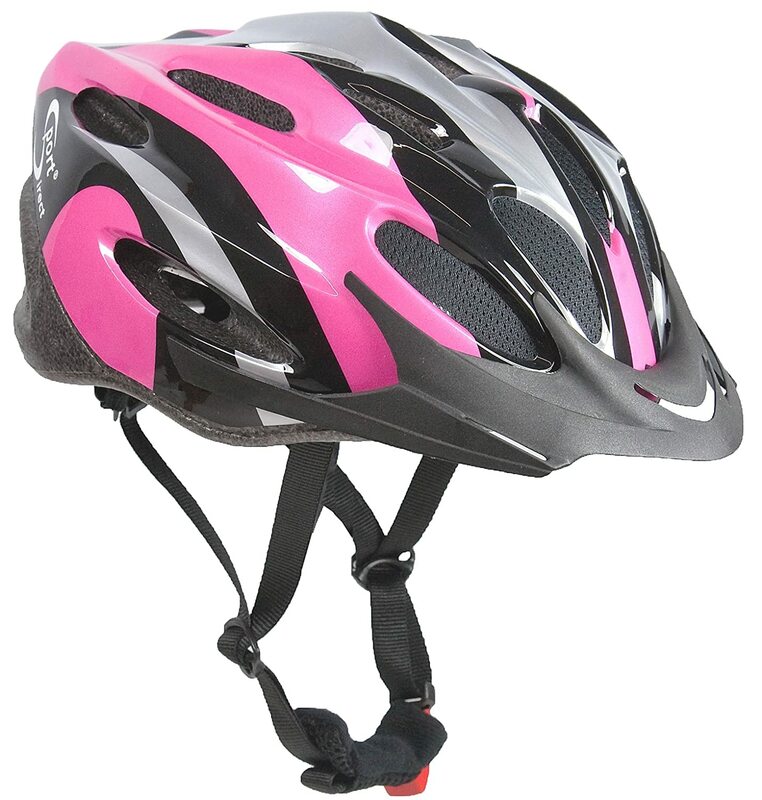 This ladies helmet comes in dashing black and pink colours. It Offers good ventilation for an average price compared to other products reviewed here (it clocks in at around £17). This helmet also has a UV tested visor and an adjustable chin strap. A handy additional detail is the use of mesh coverings on the ventilation holes. These are designed to prevent insects getting into the helmet. Though it is marketed for ladies, this helmet can of course be worn by anyone who wants to – provided that it fits. This standard helmet comes in 13 or more high vis colours. The shell is made from traditional EPS, and there is plenty of ventilation. It has a nice, average price of around £23 and so is a great all rounder for all the family. The perfect choice if you just want a classic, safe and comfortable bike helmet and do not need any frills or expensive extra features. Towards the upper end of the average price spectrum (£25), we have this professional looking black helmet. This product offers what is perhaps the greatest amount of ventilation out of all of the items on this list. It has no less than 24 air vents. Its design is both robust and very lightweight. It is made from a mix of EPS and polycarbonate which means that it will withstand impacts very well. Despite this, the helmet will feel hardly noticeable as you cycle along. This helmet’s provision of rear ventilation panels (mesh covered as with the other Sports Direct option on this list) could be a clincher for many buyers. As well as looking cool and not costing too much, this helmet has an adjustable chin strap and an adjustable headlock too. This enables the wearer to adapt the helmet perfectly to the shape of their head. Again, though Sports Direct tend to market their helmets in a gendered way, this helmet can be worn by anyone who likes the design and the price. Like the other Prowell items on this list, this helmet offers the ability to withstand multiple impacts as it is made from dual density materials. It also has other classic Prowell features, including a reflective strip. The ventilation panels – which are wider than those of the other bike helmets reviewed here – might be one reason to choose this helmet over similarly priced options (this product costs on average £25). With a price that can stretch up to £92, this is easily the most expensive helmet on this list. Nevertheless, with its high vis lime green hue it looks very cool and is perfect for professional and amateur cyclists who want to race in style. A tiered ventilation system (featuring 25 wind tunnel vents), extra stable design and plush interiors make it wonderfully comfortable to wear. It is also very light weight (another factor which makes it ideal for wearing for racing) thanks to its construction using the coveted ‘In-Mold’ method. The design of this helmet was inspired by cycle race, and so it has wonderfully aerodynamic properties, enabling you to streamline yourself, your bike and your helmet so that you can whizz along as quickly as can be. If you are willing to pay more to get a state of the art, high performance helmet, this product is highly recommended. Whether you are training for a professional race or just seeking a helmet that will keep you safe as you cycle into town, this list has something for you. No matter what your budget, you will find a fully safety tested helmet here. The best cycling helmet depends on your preference. You can spend less than £10, the average of £20 or £50+ on your new piece of kit. With different selling points on offer (like ventilation, high vis colours and inbuilt visors), these helmets all have something unique to offer. Work out what your priorities are, calculate your budget and decide which helmet style and colour you look best in. Then, honing in on the helmet that will be just right for you will be as easy as can be.